Sunday’s 153rd edition of the $1 million Queen’s Plate features a 14-horse field and morning line favorite Strait of Dover shoots for a four-bagger. #4 Strait of Dover (3-1) stretched out successfully in a facile Marine tally May 12 and should be on or near tepid splits from the outset. Justin Stein rides him well and he clearly enjoys the Woodbine surface. His sire English Channel was a long distance turf specialist so ten furlongs could be within his grasp. #7 Golden Ridge (6-1) is my value top. The lightly raced, improving colt is bred all over to adore this longer journey and has enough positional speed to keep the leaders in his sights. #8 Ultimate Destiny (20-1) has Pleasant Tap on the bottom of his pedigree and should continue to improve with added distance and experience. His last two numbers were his best yet and a tactical trip at square odds is anticipated. #1 River Rush (4-1) is on the upswing and packs a nice late kick. He gets his stamina from dam sire Lemon Drop Kid and will try to get involved late. #14 Irish Mission (10-1) lost her first six races but the rapidly improving sort exits back-to-back local wins including the Woodbine Oaks. She looms a pace player at the very least and can compete here with another forward move. Her late pace numbers are on the low side so she could prove vulnerable in the lane. 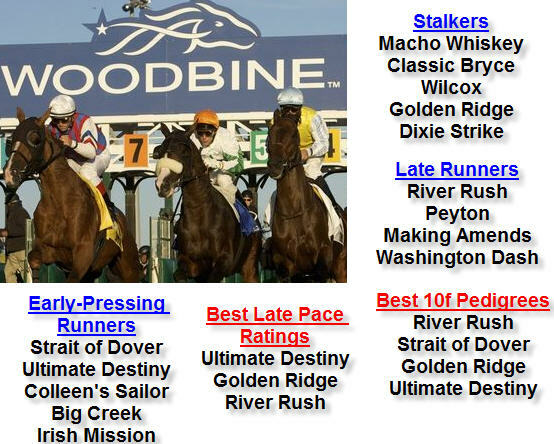 #10 Dixie Strike (8-1) was a hot commodity in the Woodbine Oaks but ended up a disappointing 5th that day. She smartly captured the G3 Selene on May 13 and might be best up to a mile and a sixteenth. She adds blinkers for this. #5 Classic Bryce (12-1) hit the board in his last three local stakes route attempts and can contend for a minor award in this spot. #6 Wilcox (20-1) has only raced twice and owns a nice pedigree (Giant’s Causeway-Seeking the Gold). He graduated from post 14 on the turf here last out and moves back to synthetic for trainer Josie Carroll. Trainer Roger Attfield seeks his 9th Queen’s Plate win with #9 Colleen’s Sailor (15-1). The sophomore son of Northern Afleet exits a local nine furlong entry level tally but needs to earn better numbers to compete here. #3 Macho Whiskey (15-1) finished 5th and last in his lone local route attempt May 27 but was only beaten a length and a half. He ran well in a pair of sprints before that and figures to push the pace under Emma-Jayne Wilson. #12 Big Creek (10-1) will take some action due to connections (Dominguez-Pletcher). He chased and weakened to 4th in the Plate Trial, and the son of Indian Charlie might run out of gas at ten furlongs. #2 Peyton (20-1) finished 5th in the Plate Trial last time. He was 5th in his other stakes try as well and might need easier company and less ground. Julien Leparoux rides. Late running sprinter #11 Making Amends (20-1) flattened out in the nine panel Plate Trial and does not figure to fare much better in this salty spot. #13 Washington Dash (50-1) is still a maiden after three tries. He ran better over the Arlington weeds June 10 but figures to fail this class test. 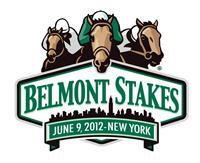 We have a $30,000 Belmont Stakes Day game on tap for Saturday. The buy in is $175 and the Prize Distribution goes down to 32nd place. Winner brings home $10k. Also scheduled for Saturday is our $1,000 Belmont Stakes Survivor. The Derby Wars survivor games are a great value. The buy in is $4 and you can purchase up to three entries. If you selection finishes 1st, 2nd, or 3rd, you survive to the next contest race. First place gets $750 and second place brings home $250. Other games scheduled for Saturday include a $150 Belmont Survivor, a $500 Belmont Park game ($12 buy in), and a $600 Belmont-Hollywood game ($25 buy in). As usual, I will be joining Steve Bortstein on the Fast Track this weekend. The show airs weekends at 10am ET and we do frequently go over the following hour by about 5-10 minutes, so we’re not automatically done at 11am ET. Click here to listen to the show. Check out HRN for updated Belmont Stakes 2012 news, including results, recaps, videos, and selections. For Saturday, I posted free analysis of the Grade 2 True North Handicap. I am offering full card analysis for Belmont Stakes Day on my Today’s Racing Digest Handicapper Page. The cost is $10 and includes wagering strategies for all 13-races. Primary/Secondary Pick 6 Tickets included as well. I have also posted a bonus Saturday free play (Belmont race 13) on my Digest Handicapper page (click view sample). Note that I posted my analysis before I’ll Have Another scratched, but I have never been a fan and he was not part of my top four selections anyway. Which horse has the best pedigree to handle twelve furlongs in the final leg of the Triple Crown on Saturday, June 9 at Belmont Park? My Belmont Stakes alphabetical list continues with Unstoppable U.
Unstoppable U’s sire Exchange Rate (by Danzig) won 6 of 15 races from 1999-2001 including the Risen Star Stakes and G2 Tom Fool. The Three Chimneys Stallion is responsible for 31 stakes winners including Ermine and Xchanger. Exchange Rate’s sire Danzig (by Northern Dancer) won all three career starts in New York. The influential stallion died in 2006 at age 29. He sired such prominent runners as Chief’s Crown (3rd ’85 Belmont Stakes), Stephan’s Odyssey (’85 Belmont Stakes runner-up), Danzig Connection (’86 Belmont Stakes winner), ’92 Preakness hero Pine Bluff, and Breeders’ Cup Mile winners Lure and War Chant. Trainer Doug O’Neill announced on Dan Patrick’s radio show that I’ll Have Another will be scratched from the Belmont Stakes. When asked by Dan Patrick if we would see I’ll Have Another race again, O’Neill responded that if he had to gamble we have already seen I’ll Have Another’s last race.